Traveller: Travel News and Stories: Destination Austria Travel Manual 2010 - out now! March sees the launch of Destination Austria Travel Manual 2010 the must-have research tool for everyone planning a holiday to Austria this year! And there is no better time to book an Austrian holiday than now, due to the strong Australian Dollar which appreciated more that 20% against the Euro compared to March 2009. This makes a holiday to Austria much more affordable again! Visitors to Austria love travelling around the country for many different reasons. One of them is certainly the special mixture of tradition and innovation, which can be encountered at every corner. Especially in Vienna, the capital, and the larger cities like Graz or Salzburg, where cultural treasures from many centuries face modern art and architecture. Not to forget about Austria's music and theatre scene – the immense number of festivals and performances that can be seen – from medieval to classic and avant-garde – taking place throughout the year. Astrid Mulholland-Licht, Director Australia/New Zealand of the Austrian National Tourist Office comments: "The new travel manual also offers a variety of tips for music & art lovers tantalizing tastebuds at the same time: Austrian culinary delights matched with cultural experiences – a truly delicious way of exploring my home-country!" Destination Austria Travel Manual 2010 incorporates a detailed listing of Australian and New Zealand travel companies offering a large product range of Austrian holiday experiences from city stays to Danube cruises, ski vacations to musical/cultural packages to name a few. It also includes flight information, travel tips, accommodation guides and features handy listings like a web-directory, distance charts and chapters on rail travel as well as a colour map of Austria. 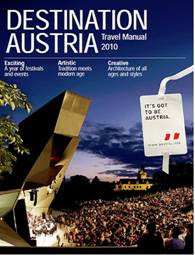 To order a FREE copy of Destination Austria Travel Manual 2010 call (02) 9299 3621 or email info@antosyd.org.au.